Wall comes from Latin vallum meaning "...an earthen wall or rampart set with palisades, a row or line of stakes, a wall, a rampart, fortification..." while the Latin word murus means a defensive stone wall.English uses the same word to mean an external wall and the internal sides of a room, but this is not universal. Many languages distinguish between the two. In German, some of this distinction can be seen between Wand and Mauer, in Spanish between pared and muro. The progressive/psychedelic rock band Pink Floyd used a metaphorical wall to represent the isolation felt by the protagonist of their 1979 concept album The Wall. The American poet laureate Robert Frost describes a pointless rock wall as a metaphor for the myopia of the culture-bound in his poem "Mending Wall", published in 1914. In George R. R. Martin's A Song of Ice and Fire series and its television adaptation, Game of Thrones, The Wall plays multiple important roles: as a colossal fortification, made of ice and fortified with magic spells; as a cultural barrier; and as a codification of assumptions. Breaches of the wall, who is allowed to cross it and who is not, and its destruction have important symbolic, logistical, and socio-political implications in the storyline. Reportedly over 700 feet high and 100 leagues (300 miles) wide, it divides the northern border of the Seven Kingdoms realm from the domain of the wildlings and several categories of undead who live beyond it. 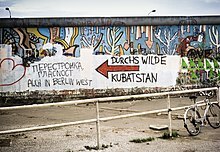 In a real-life example, the Berlin Wall, constructed by the Soviet Union to divide Berlin into NATO and Warsaw Pact zones of occupation, became a worldwide symbol of oppression and isolation. ^ "Game of Thrones: Everything to Know About the Wall". Vulture. August 27, 2017. ^ "Game of Thrones Wall: How the Wall was built, and what its destruction means". Telegraph. April 15, 2019. ^ "'Game of Thrones' Season 8: How Was The Wall Built?". Newsweek. April 7, 2019.